Shoot with greater accuracy and improved confidence using a set of the Smith & Wesson 5900 Series Rubber Grip Panels from Hogue. Slick handles make for hard to grip pistols and can cause missed shots at times of critical importance. Luckily Hogue's pistol grips provide the durable all-weather gripping strength to prevent just such a scenario. 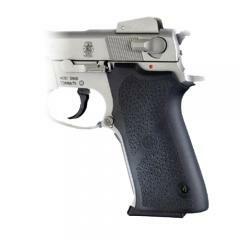 he panels are custom molded to for an exact fit the does not affect the use of the weapon's safety or magazine release. Its texturized exterior disperses water for improved retention is wet conditions or with sweaty palms as well as provide a pleasing aesthetic that is sure to impress. The grip panels are easy to install and require no gunsmithing or permanent weapon modifications.